Did you know one of the largest, interactive art centers in the country is located in downtown Reading, Pennsylvania? GoggleWorks Center for Arts is a 145,000 square foot complex featuring six teaching studios; 35 juried-in artist studios; several exhibition galleries; a film theatre; cafe; and gift store featuring handcrafted works by over 200 artists working within our walls and beyond. Here’s our top picks of things to do when you visit! Learn about our history and see our artists in action! GoggleWorks offers free, guided tours of our campus every Wednesday at 1:00pm. 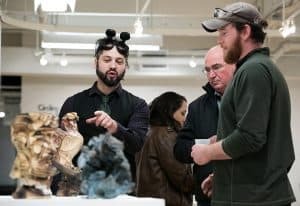 Guests can learn the history of our building, once the first factory in the United States to manufacture optical lenses, explore our teaching studios, and see artists in action. Tours meet at the Information Desk and last approximately one hour. 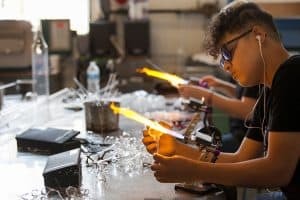 Private group tours, accommodating up to 100 guests, can be scheduled any day of the week and include a glassblowing demonstration in our Hot Glass Studio. The Boscov Film Theatre at GoggleWorks presents a high-quality selection of art house, independent, and international films. Screened daily at 3pm & 7pm, discount tickets are available for matinee and seniors. Afterwards, pop into our Store, where you’ll find the area’s finest selection of handcrafted items, including creative toys, apparel, jewelry, home goods, and original artwork. Get the full GoggleWorks experience during our free, monthly Spotlight Nights. These fun-filled evenings include exhibition openings, artist talks and demonstrations, open studios, walk-in workshops, and more! Complimentary wine, beer, and light refreshments are available. Check our website calendar for upcoming dates. Our Maker Dates, offered in our Ceramics, Hot Glass, and Warm Glass studios are a creative night out for family, friends, and loved ones. Enjoy a short studio tour, instructor demonstrations, and then make something of your own. Afterwards, mingle while enjoying beer, wine, and light refreshments. No experience necessary. Advanced registration is required. GoggleWorks offers opportunities for creative exploration and hands-on, immersive learning year-round, including 2-3 hour workshops in a wide range of mediums. Check out our new Handcrafted Home series are project-based workshops designed for all skill levels to, not only learn a new craft, but to enrich their home with a handmade, personal object. Our Saturday Kids Series offers opportunities for kids ages 7-12 and 13-17. Advanced registration is required.